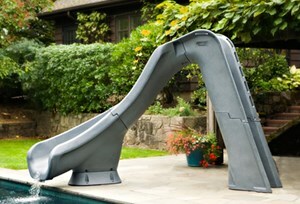 Bring the water park home with this compact pool slide that provides big fun! 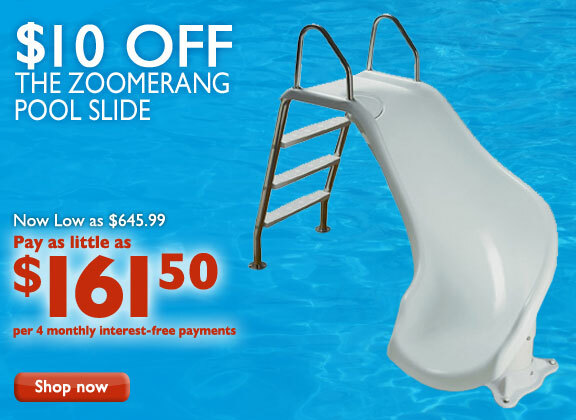 Great for in-ground pools, the Zoomerang pool slide really packs a punch without taking up a lot of space. The revolutionary Zoom-Flume water system, a standard on all Inter-Fab slides, creates a torrent of water that adds even more to the 37" high seating area. This system provides a rush of water to give you that water park-like ride right in your own backyard. The Zoomerang slide features grip-around handrails, and non-slip safety treads to prevent "slip throughs" when climbing up the ladder. All Inter-Fab pool slides meet or exceed the U. S. Consumer Product Safety Standard for Swimming Pool Slides, (16 CFR 1207). This full-sized addition to our rotomolded slide line (heliX, TurboTwister® and Cyclone) stands 7'4" tall to the top of the handrails, and is available in sandstone and gray granite. Enclosed ladder and molded handrail design for maximum safety. Our unique GrandRapids water delivery system offers lots of rushing water for a fun ride. - See more at.